Every interior designer knows that a carefully conceived and chosen colour scheme can be ruined, either by a single or cluster of glaring interior lights, and if your entire room is lit only with dim lights, there will be a depressing mood in the room, asides the fact that there will be insufficient lighting in different zones of the room’s interior. When a room is lit effectively, you will observe that colour tones change with different lighting illuminates. This is why any interior space will have a completely different colour palette and ambience when viewed under different types of lighting like daylight, incandescent lights, warm (or cool) fluorescent light fixtures, and halogen lights. A good design job demands you consider the effects of natural light on colours, textures, and patterns. For instance, bright sunlight conveys a wonderful feel on both warm and cold colours. 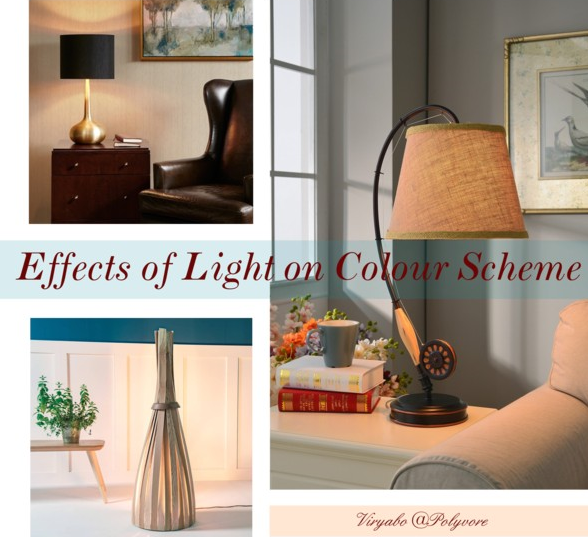 Its effect on lighter colours and pastels is radiant and bright, and on darker colours, bright light makes them look crisp and ‘illuminated’. Rich, bold and intense colour schemes that look pleasing during the daytime are usually dulled by incandescent lights at night. And though incandescent lights emphasise colours like yellow and red, which means they accentuate red, orange, and tan, they, however, produce a dulling effect on blue, burgundy, and violet tones. There are two types of fluorescent lighting, warm and cool. Both types are popularly used by interior designers in their lighting designs. Fluorescent lights have a different spectral energy distribution of light which makes them emphasise blue and green colours while blunting reds and orange tones. They are white lights which bear a resemblance to natural light. Halogen lights make all chosen colours appear more vibrant and have a way of making the transition from daylight to artificial light a bit less ‘jarring’ like it does with incandescent lights especially. On a final note, because of the different way differing lights affect colour schemes, it may be wise for an interior designer to select colour samples in the rooms or spaces in which they are to be used, under both day and night light. And if for any reason this is not possible, the next best thing is to choose colours under an identical lighting source using approximately the same illumination level . . . bright, mood enhancing, or dim.